Now that you have a cured log to work with, it’s time to split it up into staves or the rough pieces from which you can make a bow. But before we start splitting, let’s take a moment to get an idea of what we’re working towards. 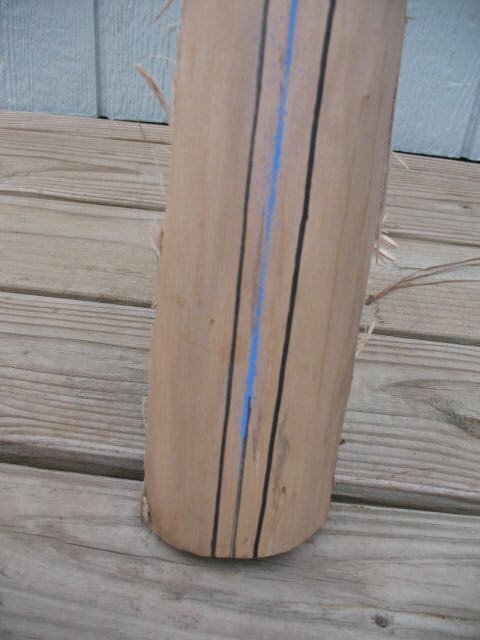 What you are wanting to end up with is a one piece wooden bow often called a “self bow.” If you look at the end of a log, you will see a series of concentric rings starting with a small circle in the middle and working all of the way out to the bark of the tree. Each of these rings is a layer of wood that represents one years growth of the tree. The wood fibers in any given layer are tightly inner twined with each other to form a strong but flexible ring of wood, however the separate rings are not tightly attached to each other. If you want to test this statement, take a peeled hickory log and start banging on it with another heavy stick. After a while the wood will start to separate and you can peel it off in strips that are exactly one growth ring thick. Now try and tear one of these splits in half. You will find that it is very hard to do. By the way, this banging on the log to split it into layers is one method of producing hickory splits for basket weaving. So what does all of this have to do with bow making? Well, the back of a bow (that’s the part that is away from you when you are shooting the bow) is under tremendous stress when the bow is drawn. If the back of your bow is one unbroken growth ring from end to end, it will hold tightly together even under the stress of being bent. If, however, you cut across the growth rings when you are shaping the back of your bow, the growth rings will separate from each other when the bow is bent. Where the growth rings separate the bow will break. So we want to produce a bow that has an unbroken growth ring for the back. The easiest way to do this is to use the outside of the log for the back of your bow. 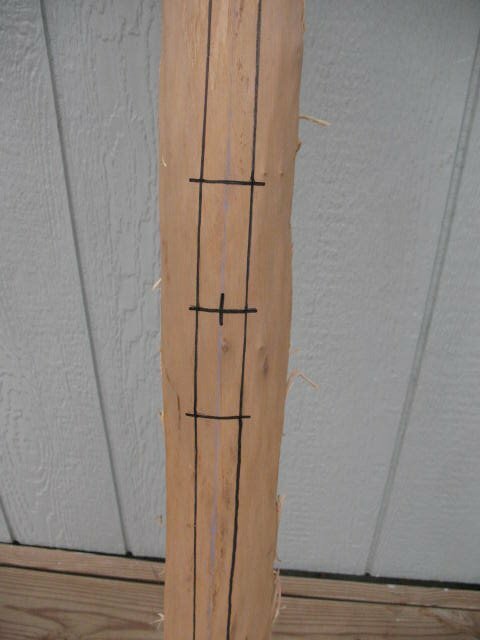 Now let’s take a good look at your log and see where we want to split it in order to produce four staves that can be worked down into bows. First check and see if the log has stayed fairly straight while it was drying. If it has become badly bent you can still probably get one good stave out of it, but if it stayed straight you may get several. Let’s assume that the log is still straight. Look at it. Where can you get the best bow out of it? Are there knots or scars on the log? If there are, it would be best to avoid them. If you can’t avoid them then it is best to try and keep them in the middle of the bow. The handle is not under nearly as much stress as the limbs, so if you have a knot in the handle it probably won’t weaken the bow. Small knots on the limbs will not weaken the bow too badly as long as they are in the center of the limbs and not on the edges. We will talk more about knots when we start shaping the bow. 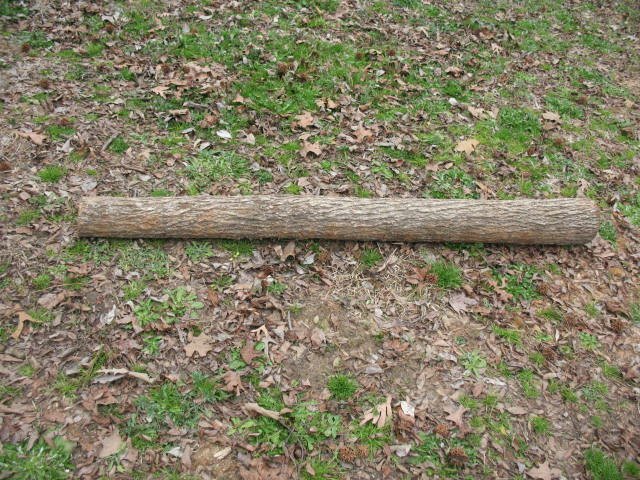 Pictured below:straight five foot long log of American elm. Now that you’ve decided where you want to split the log, take a look and see if that is where the log wants to be split. Are there any checks in the log? If it has already started splitting on its own you might want to reconsider and see if you can’t just extend those splits rather than starting some new ones. If you left plenty of extra length to work with a few end splits probably won’t bother you, but if you’re running short on wood you may have to go with the natural splits even if it means losing a stave or two. Whatever you do don’t ruin your log by trying to force it to give up four staves. Its far better to have one really good stave than to have four third rate ones. 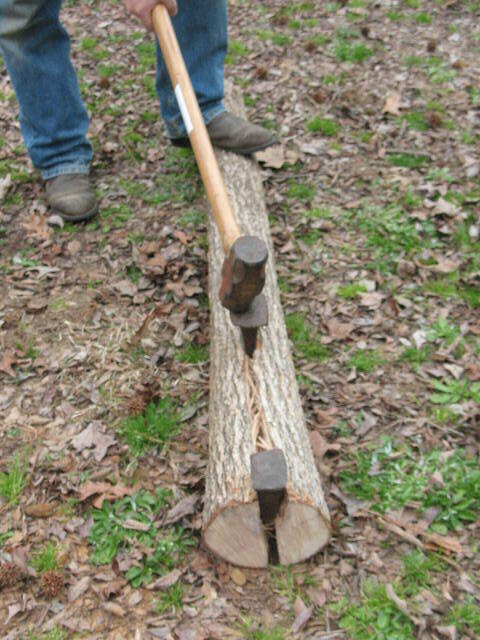 Pictured below: Splitting the log with sledge and steel wedges; and log split in half. Once as an experiment on doing it the old way I used some wedges made of elk antler and a hickory club to split out a bow stave. It worked fine, but under normal circumstances I use steel wedges and a sledge hammer to split out my staves. Just stand your log up on end, pick the place that you want to split it, lay the blade of one ax across the end of the log, and use the other ax to start hammering it down. Once the log starts to split it will usually split pretty straight down the center, but don’t count on this. Go slow and make corrections where necessary. 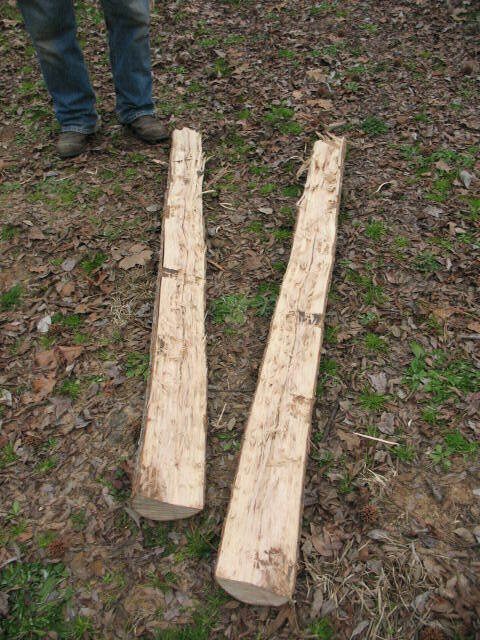 When you have successfully split your log in half, take each of the halves and split them in half. You will now have (maybe) four staves to work with. Pick the best one and you can begin laying out your bow on it. If you removed the bark before seasoning your log you may go directly to laying out the bow. If you seasoned your log with the bark on, you will need to carefully remove the bark before laying out. Be sure to not cut into the whitewood that will become the back of your bow. 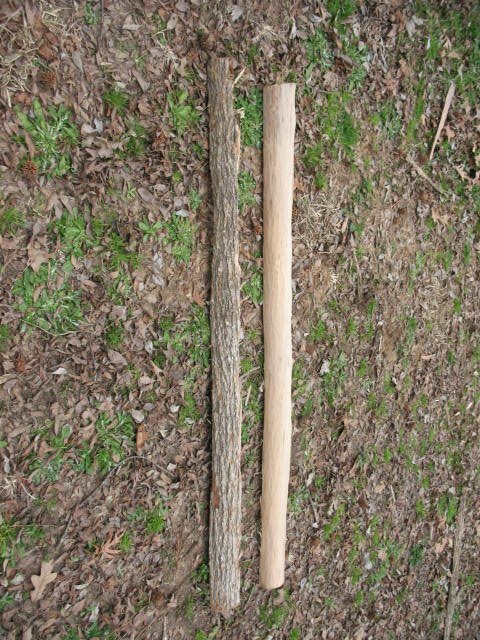 Pictured below: two staves, one with the bark peeled and ready for layout. Now let’s lay out the bow. First you will need to decide on the shape of bow that you want. I usually make plains style bows that are 48″ to 52″ long and taper evenly from about 1 1/2″ wide at the handle to 3/4″ wide at the tips. You may want to make a bow that is narrow at the handle, widens out on the limbs, and then tapers down at the tips. 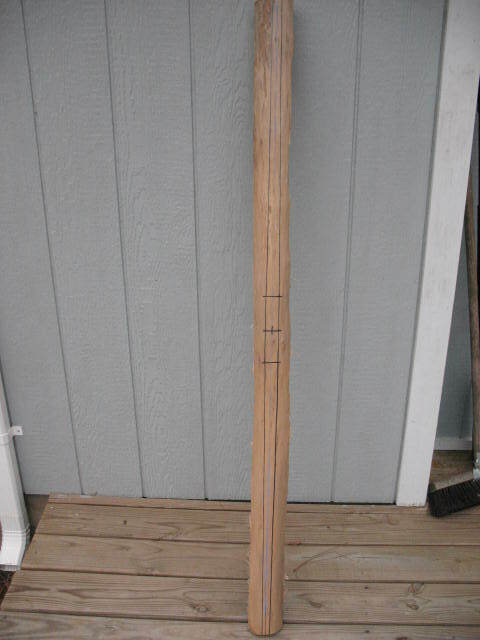 Or you may want to make an English longbow. The choice is yours and the procedure is basically the same. The following directions are for laying out a plains style bow. To lay out the limbs you need only draw four lines. Each line will start at a corner of the handle and extent up or down to its corresponding mark on the bow tip. You now have the front profile of your bow laid out. We will not worry about the side profile until we have cut out the front profile. You may use your ax, knife, and/or draw knife to carefully trim away the side wood leaving only the front profile of your bow. Be sure that you leave the sides of the bow straight up and down. You don’t want the sides of the bow to slant in or out from the back to the belly (the belly is the part of the bow that faces you when you are shooting). Pictured below: handle and limbs laid out and ready to start removing wood. In the next post we will discuss laying out the side profile of your bow, and the all important tillering of the bow.